Eva’s feature cover and editorial for InStyle Russia’s September 2018 issue has been added to the gallery. We also added an English translation courtesy of our contributor Irina. 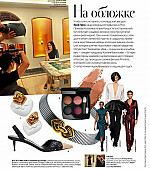 Thank you to InStyle Russia for providing the scans and to Irina for kindly translating the interview! 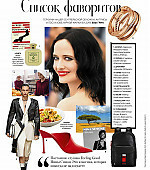 Eva Green flies higher and higher. Next year the actress turns into a trapeze artist in the circus and an astronaut at the International Space Station. Also, she became an ambassador of a well-known jewellery brand Bulgari. So, the roads led to Rome. I nearly quarrelled with my children because of Eva. We couldn’t decide who loves her more and who has more rights for her. My daughter thought of the adorable “The Dreamers”, but my son referred to Serafina Pekkala as a fine specimen of a woman in “The Golden Compass”. On the other hand, I backed up Vesper Lynd from “Casino Royale” and Miss Peregrine from “Miss Peregrine’s Home for Peculiar Children”. My peculiar children wrote her letters and even tried to buy autographs online. However, I won. Actually, I’ve met Eva Green three times already. The first time I talked to her in Salzburg eight years ago. She did her job well by answering all even awkward questions. Eva got used to long interviews after each new movie she appears on screen. Journalists want to know everything, how she sees her character, who her boyfriend is, and what cream she uses. Her manager Charles complained that day: “She always thinks she isn’t beautiful enough. She avoids interviews and journalists, who distract her with sweet questions and then ‘punch her in the face’”. After that, when she wasn’t so busy, we had time to speak at the reception in the public garden, where she hid behind the bushes with a glass of water in her hand to avoid meddlers asking for another selfie with her. She seemed to be afraid of this, as if people were eager to tear her apart into pieces and carry her away in their cellphones. Now she’s in Rome in Hotel de Russie in its mysterious garden, where a lot of stars of the past Roman period left their traces. I tell her that probably a new age of cinema has just begun. Or it is better to say that the old era returned when people go to the cinema not to watch a new movie but to see a well-known actress. Dark haired Green is the same dark queen as Anna Magnani and Sophia Loren. What were you doing there? What were you searching for? A beauty salon? Pastry? Fish or meat? Eva Green will be starring in “Proxima” by French director Alice Winocour (She is also partly Russian. Her family is from Berdichevo). In Proxima, Eva plays an astronaut who is going through training in Star City to go to the International Space Station. “Proxima” will be released next year as well as the new movie of Tim Burton. I always thought they were made for each other. Eva could have played Edward Scissorhands in place of Johnny Depp. For several years now, Eva has been Burton’s muse. They met on the set of “Dark Shadows”. After a while, she received a call from him to play the most recognized of her roles of Miss Peregrine. She says she didn’t give it a second thought. She was ready to play anything in Burton’s movies “even a table or a lamp”, but played the leading role of “Scary Mary Poppins”, the one she really missed to meet during her school time. Eva Green confesses that in childhood she was extraordinarily shy. It was a torture for her to stand in front of the class. “I have never been to my friends’ birthday parties I was scared of clowns at such events.” She took up theatre classes to get rid of the shyness. Now we see what this led to. She will next be seen in Tim Burton’s “Dumbo”. Do you remember a Disney cartoon about an elephant which could fly because of the enormous ears and became a circus star? Of course, I’m eager to see a pink elephant march as depicted by Tim Burton, but who does Eva play there… a crow? I remembered the time when she refused to reshoot some scenes in “The Golden Compass” because of the phobia and asked if she had a stunt woman. At last, she isn’t a pretty witch! Not only in “Miss Peregrine’s Home for Peculiar Children” but also in “The Salvation”, her princess in black dress doesn’t look like a rascal’s girlfriend but an alien from another planet. It is great. Probably, this is why we like you. In this case I’m very interested how she buys clothes. What happens in the shop when Eva Green is in the fitting room? I can’t imagine. It’s beyond my imagination. I ask what else she is doing in Rome besides her Bulgari photoshoot. She says she eats and just enjoys it. Is it true that you collect insects? She was afraid that people would start thinking she had her roles because she was the daughter of Marlène Jobert. It’s not frightening anymore because now Marlène Jobert is famous because she is the mother of Eva Green. Do you regret any roles you didn’t play? What about those you’ve played? So again, I have to argue with my children which role in Eva’s career is an odd one. Wow! Thank you so much for publishing this and thanks to Irina for her kind translation. It’s so wonderful to read about the gentle sensitive real human Side to this amazing woman. Yes you are private and mysterious and beautifully humble. In your humbleness and broad minded approach you are ever more adorable. I hope you are truly recognised for the incredibly talented actress you are as much as you’re loved for your stunning beauty. I hope your next films are worldwide smash hits just to give you the recognition you deserve. I hope you’ll own one of my paintings of you by this time next year and make my dream come true too! With much love, respect and admiration. A humble artist and huge fan & admirer. You are welcome! Enjoy Eva Green! I really miss Eva Green and her work. I am so glad you have posted this. It is definitely one of my favorite interviews now especially because the writer was a fan of Eva, herself. I cannot wait for her upcoming projects especially because 2018 was really just quiet. Thank you! Thank you! Thank you! Also, I want to make a guess for her role that was the “odd-one-out”. Probably, Morgan Pendragon. lol. Camelot was just my least favorite from her work so I chose her.